Conservatories are becoming an essential addition for many UK homes, being an easy and effective way to increase both space and natural light into your home. At A-Rated Home Improvements we regularly install a range of high quality uPVC conservatory styles in South Wales, each having their unique advantages and features, and at affordable prices to ensure no homeowner needs to miss out. Whether you’re looking for an Edwardian, Victorian, Gable End, Sunroom or Combination Conservatory, we’re sure to have the perfect solution for your home. Furthermore, we also offer a Bespoke Service, providing you with a living space that is tailored to your specific needs, offering an unique addition to your home. So, if you live in the South Wales area and looking to enhance your home with a Conservatory, please don’t hesitate to contact us today! One of the most popular conservatory styles in the UK, Victorian conservatories feature ornate ridge detailing and steeply pitched roofs which combine to give a classical appearance. Readily adapted to any style and wildly affordable, Victorian conservatories are simple yet effective. Flat fronted and capable of being installed in a square or rectangular shape, Edwardian conservatories are incredibly space efficient – allowing homeowners to enjoy the maximum amount of space possible. Its sloped roof and contemporary style is suited to most properties. Instantly bringing a sense of grandeur and scale to any home in which they are installed, Gable conservatories make a stunning impact on the inside and outside of your home. Thanks to their uniquely apex roof, Gable conservatories bring natural light from roof to floor. Sometimes referred to as “lean-to” conservatories, a sunroom conservatory installed by our team is perfect for homes wanting to add some much needed extra room but are not blessed with space. One end slopes away from the wall, making the most of the area available. 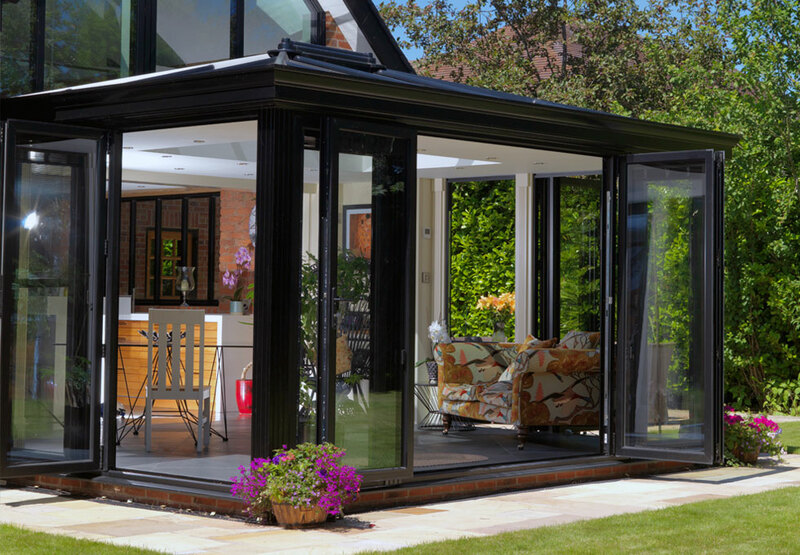 Typically installed in either a P, T or L-shape, combination conservatories allow homeowners to make the most of available space and create multiple rooms under one roof. This style offers great design flexibility, creating two or more distinctive areas in which to utilise however you choose. Created by a second tier of windows placed upon your extension’s main roof, lantern roofs can be installed onto almost any existing conservatory to add both height and presence to the interior. This second tier structure also provides homeowners with added ventilation and decorative capabilities. Craving a conservatory style that’s wholly unique to either you or your home? At A Rated Home Improvements, we have the ability to produce totally bespoke conservatories tailored to your own needs and designs. Simply enquire with one of our friendly advisors, and we’ll make your dream a reality. All of our conservatory styles are constructed using the highest quality of uPVC to guarantee exceptional comfort and thermal efficiency, achieving an A-rating from the WER as with the rest of our product range. Triple glazed as standard with optional specialist glass roofs, your new conservatory will stay cool in the summer and warm in the winter. I contacted A-Rated Home Improvements in order to upgrade and secure our fire escape and kitchen windows on the business premises. From the start the guys at A-Rated were extremely helpful and thorough in their approach taking time to understand exactly what we wanted. They went out of their way to manufacture and install our reinforced door and windows to the highest standard in both a quick and efficient manner. Their pricing was extremely competitive with other companies we had contacted,and they were always openly upfront of the cost both in manufacturing and installation. The level of service received was exceptional throughout and they will be our first choice for any work required in the future. Thanks again! I had 10 windows, a back door, and composite front door installed in 2013. I was extremely happy with A-Rated's approach, they were very honest and gave me one price which I appreciated, no bull or 50% discounts If I 'buy on the day' like I had with other companies. They weren't the cheapest company I had out, but their price was reasonable, and their workmanship was of the highest quality. I received my guarantees 3 weeks after completion and have had no issues since that day. Would definitely have them back.